Now back to your regularly scheduled content. Good news, I survived my “new endeavor” in running. I still need to get my recollection post out (on my other blog), but as a quick summary I decided to add more challenge to my running passion and decided to move into trail racing. Probably wouldn’t recommend to others to start out in this version of the sport with a half marathon… in a hilly reservoir… with technical sections … and creek crossings. That run is only second to my marathon run in terms of toughness. It also happens to be one of a very few races I had a smile on the entire time. Amazing and needless to say, totally hooked – a round of claps for trails! Well, actually more like a Clapper – and not the trail kind – rather the Rail kind. This rather large bird is the latest to bear the check mark on my birding list. We came upon this specimen on our birding trip to South Padre Island over the holiday break last December. The South Padre Island Bird Viewing and Nature Center has easily become one of my favorite birding locations adding new birds to my list every time we make it down there. 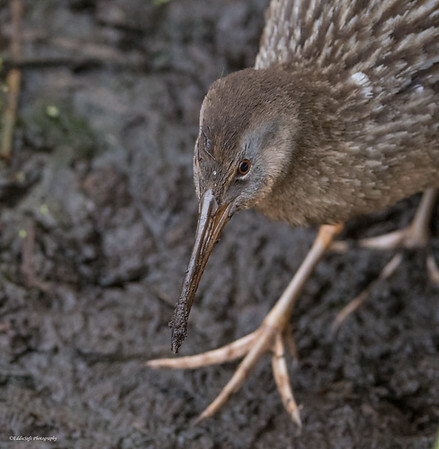 If you have spent any time at all on my Wildlife Blog you already know how amazingly productive that location is thanks to an extensive boardwalk that allows access to the marshes without disturbing the birds. 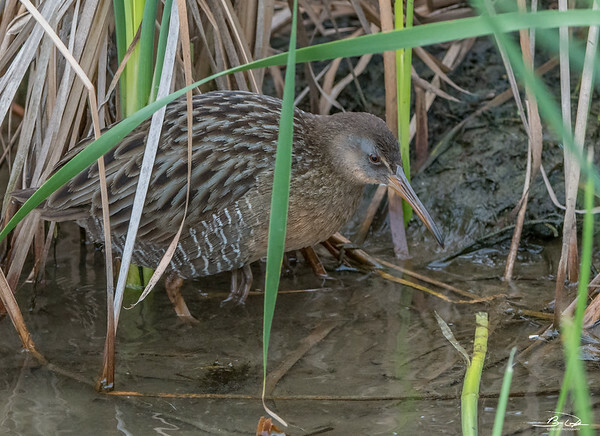 This one was found in nearly the same location where we spotted the Virginia Rail on a previous visit (link here). Hit the jump to read more about this interesting bird! The Virginia is significantly smaller than the Clapper. 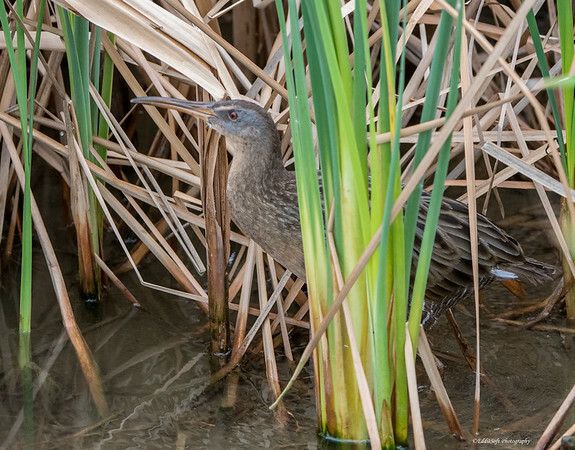 When this one walked out of the reeds there was no question it was the Clapper, Problem was it really didn’t want to be seen. I must have looked like an idiot as I bounced from one side of the boardwalk to the other trying to figure out where it was. 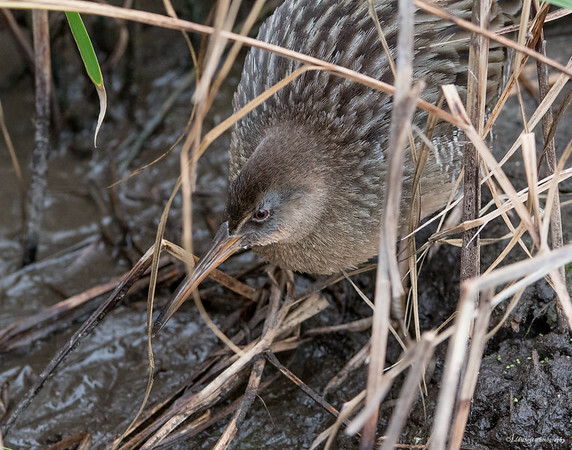 Other birders would come up and ask what I was looking for – “There’s a Clapper somewhere here but good luck trying to find it!” Eventually it would poke its head out and probe the marsh. By the time I got the glass locked and focused on it, the damn thing would scurry back into the reeds or into the safety under the boardwalk. Surprised there were any decent pictures in the tin at all. Probably spent at least an hour tracking this Clapper. Admittedly, part of that time was wondering if the circle of life was going to play out. 30 feet from the boardwalk a medium sized Alligator was hanging out next to the shore. Just realized I forgot to process those shots. Will try to remedy that next month. Until then, imagine about a 6 footer submerged in the water except for its nostrils and eyes. Eventually figured out it was resting its head on a piece of pipe allowing for it to remain there effortlessly. The Clapper would pop out and I’d immediately look over at the Gator to see if there was any reaction – nope, just stayed there enjoying the lazy day. Not that I wished any harm to my new feathered discovery. Let’s see what else I can pass along about this cool bird. Clappers have an extra salt gland that allows them to … wait for it .. wait a bit more for it .. drink sea water. Needless to say, I had to go learn more about this gland. Turns out Gulls also have this gland which exists above the bird’s eyes allowing for secretion of extra salt. Been birding all of these years and had no clue this gland even existed. Unlike most species of birds, the male Clapper takes his turn incubating the eggs. The male usually takes the night time duties while the female is out drinking at the local bar. Slowly she staggers back to the nest after bingeing all night and takes her place on top of the eggs to sleep off a raging hangover. At one week old, the parents divide the brood and each looks after their half. Now, this has me wondering what happens in the case of odd sized broods. That puts a stamp on it – hope you enjoyed my latest addition to the bird list. 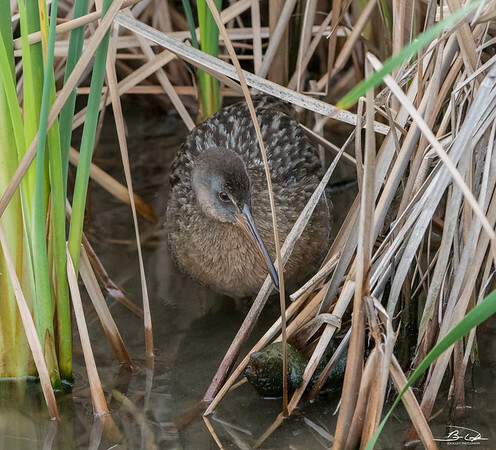 Finally have the Sora, the Virginia Rail and the Clapper Rail checked – now time to hunt down the King Rail! Amen on appreciating the soldiers who serve and have served this country on this Memorial Day in the U.S. 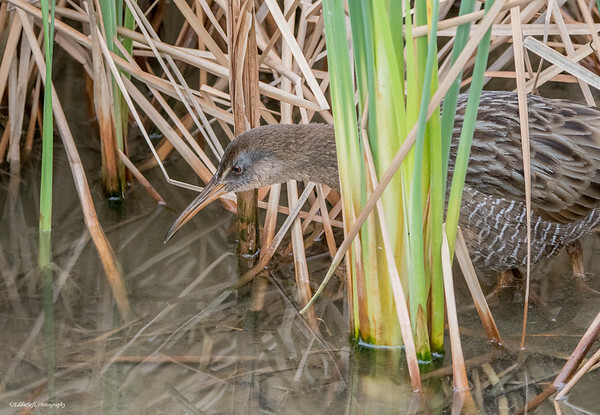 These are all very cool shots of the Clapper Rail, a bird that I (mutter, mutter) have never seen. Patience is definitely a useful trait for birders, and it worked out well here. However, the rail looks like it’s quite annoyed by all the attention. I’ve never heard of a salt gland, either, so that’s interesting. 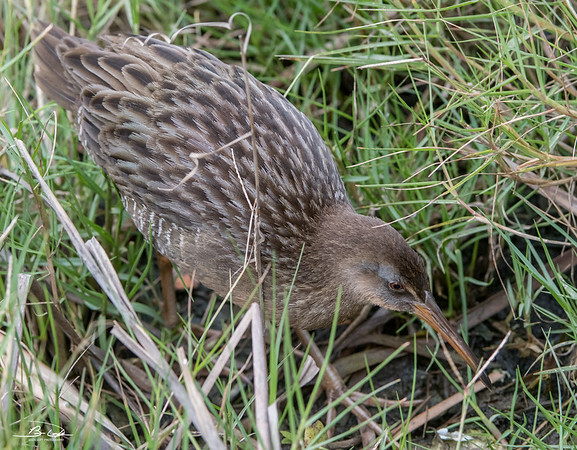 “–now time to hunt down the King Rail!” Whoa, I have pictures of a King Rail! A rare case of a bird checked off my list that hasn’t been checked off yours. – Difficult to see; runs under vegetation. This rail is only 3.9-5.9 in (10-15 cm) long and weighs only 1.0 oz (29 g). Maps show it along the Texas coast, but “scarce”. Sounds like another road trip! Whaaaat!!!???!!! you have a King Rail? I actually had no idea you had that. Undoubtedly I am going to have to head back to Texas and hunt one of those up. I purposely picked the King Rail being that I might have a chance to actually get that in the tin. Ironically, while I was in Champaign I met Brain Tang (think you know him) while we were taking pictures of the Swallow-Tailed Kite (from Tang’s site (http://www.hardrain.me/p329880692/h5698041a#h5698041a). He mentioned he as able to get a picture of the Black Rail, which like you, referred to it as the holy grail. Kind of like a birder’s business card. Hello, my name is Mr. Tang and I have a Black Rail or Hi, I’m Ron and I have a King Rail. Outside you are saying how cool … inside you are just plain jealous ha.